OWEN SOUND, Ont. 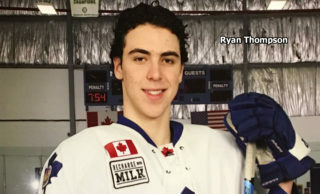 – Jacob Busch scored at 15:50 of the third period to propel the Owen Sound Attack to a 4-2 victory Tuesday night over the North Bay Battalion, snapping the Troops’ Ontario Hockey League winning streak at five games. Petrus Palmu contributed two goals, including an empty-netter, and Matthew Struthers had one goal and one assist for Owen Sound, which won a third consecutive game to move its won-lost-extended record to 16-13-6 for 38 points, fourth in the Midwest Division. Busch added an assist and goaltender Daniel Dekoning made 33 saves in both teams’ first game after the Christmas break before 3,032 in the J.D. McArthur Arena at the Harry Lumley Bayshore Community Centre. Kyle Potts and Steve Harland scored for the Battalion, which lost for the first time since a 5-4 setback via shootout to the host Sault Ste. Marie Greyhounds on Dec. 6. Goaltender Jake Smith faced 40 shots for North Bay, 17-13-3 for 37 points, fourth in the Central Division. Potts opened the scoring at 2:49 of the first period with his second goal of the season. Brady Lyle sent a sharp pass up the middle through a seam to Potts at the blue line, and he drove to the net, escaping Thomas Schemitsch’s attempt at a pokecheck to beat Dekoning. 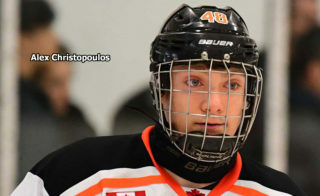 Lyle, playing a 10th straight game after missing the team’s first 23 while recovering from a broken collarbone suffered in exhibition action, earned his first point on the play. 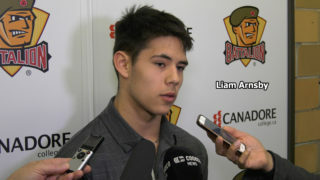 He was the Battalion’s first-round pick in the OHL Priority Selection in April. The Troops had a 10-8 edge in shots in the period, with Dekoning denying drives by Kyle Wood and Brett McKenzie. 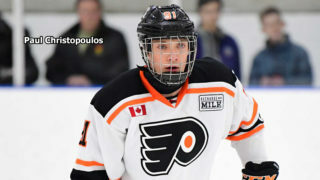 Smith stopped chances for Jacob Friend, Kevin Hancock and Jonah Gadjovich, and Schemitsch appeared to hit the left post with a high wrister from the right-wing circle in the 18th minute. The game opened up in the second period, when the Attack scored two unanswered goals while outshooting the Troops 24-14. Struthers tied it at 9:43, cruising into the goalmouth and snapping a Justin Brack feed from behind the net over Smith’s glove. Palmu then connected off a power-play faceoff at 17:27, drilling the puck from the blue line inside the right post on assists by Ethan Szypula and Josh Sterk. Smith dealt with chances for Schemitsch, Gadjovich, Busch, Nick Suzuki, Santino Centorame, Sean Durzi, Jaden Lindo, Bryson Cianfrone and Szypula, while Dekoning thwarted Daniil Vertiy, Max Kislinger, Mathew Santos, Mike Amadio and Wood. Amadio narrowly missed converting the rebound of a Santos shot on the power play in the last minute. Mike Baird initially got credit for the Battalion’s second goal, at 10:03 of the third period, but it was Harland who redirected Riley Bruce’s blast from the blue line. McKenzie earned the second assist. Seconds after a Battalion scoring chance was foiled, Busch put the Attack back in front, beating a screened Smith to the stick side from the high slot as the trailer on a rush. With Smith gone for an extra skater, Palmu slipped an insurance goal into the vacant cage at 19:23. The Battalion hosts the Mississauga Steelheads at 1 p.m. Thursday in the annual New Year’s Eve game. BATTALION BULLETS: Battalion defenceman Cam Dineen saw the end of a seven-game points streak during which he had one goal and nine assists for 10 points … The 24 second-period shots were the most the Battalion has allowed in a period this season, surpassing the 20 by Mississauga in the final frame of a 5-3 home-ice verdict Oct. 12 … The Battalion went 0-for-2 on the power play. 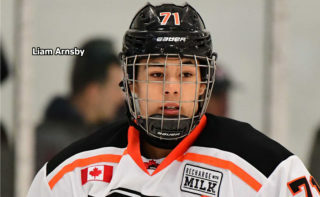 Owen Sound was 1-for-3 … Opening lines featured Amadio centring left winger Vertiy and right winger Santos, McKenzie pivoting left winger Baird and right winger Harland and Zach Poirier centring left winger David Sherman and right winger Brett Hargrave. 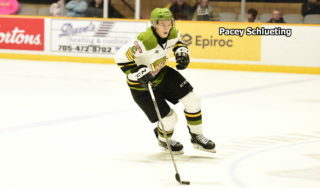 Potts centred left winger Kislinger and right winger Justin Brazeau … The Battalion was without Jake Ramalho and Jacob Ball … Hargrave, who was acquired from Owen Sound in a trade Oct. 2, faced his former teammates for the first time. He sat out all of last season after shoulder surgery, with the result that he had played with only six Attack players who dressed Tuesday night … Baird returned to the lineup from a three-game suspension for actions in a 7-2 home-ice win Dec. 13 over the London Knights … Owen Sound was without defenceman Damir Sharipzyanov, who’s playing for Russia in the World Junior Championship at Helsinki … The Attack visits North Bay on March 3.